News surfaced last year of Jordan Brand releasing another Air Jordan 10 “City” Pack in 2016. The cities that are expected to be represented in the pack include New York, Los Angeles, Charlotte and Chicago. 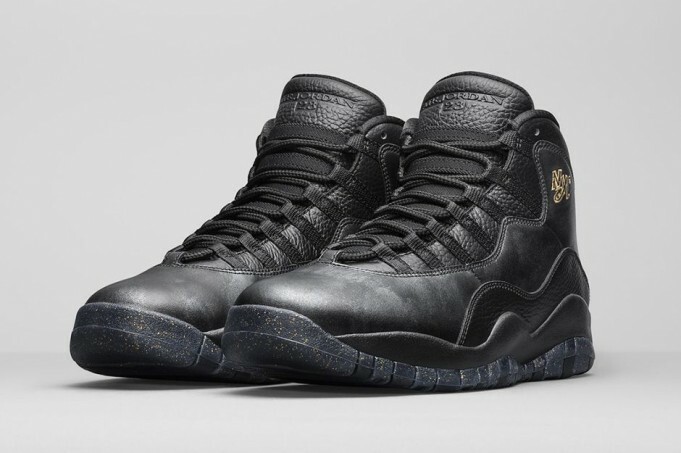 The Air Jordan 10 NYC will come in a Black leather upper with contrasting hits of gold. Both smooth and tumbled leather are found on the upper, which is nicely contrasted by the hits of Metallic Gold Coin accents found on the branding that include the NYC lettering found close to the ankle collar of the shoe. Additional gold hits are spotted on the striped heel tab as well as on the Jumpman on the insoles and the speckles on the outsole. The rest of the shoe including the laces, midsole, outsole, tongue, laces, and inner liner are all done in Black.